One of the most common questions asked by the reader is – Where you invest your money? Why don’t you share your investment portfolio? Well, as per SEBI guideline sharing of investment advice is not allowed. However, for the purpose of mutual fund analysis and not for influencing anyone buying decision, today I am going to share my balance mutual fund portfolio. It will be partial mutual fund portfolio including only balance mutual funds. What is Balance Mutual Fund? Balance Mutual Fund as the name suggests, it keeps a balance between equity and debt as they invest in both instruments. These type of mutual funds are less risky and generate moderate returns. A Balance mutual fund fulfills the objective of growth and income generation and provides best of both worlds. A Balance Mutual Fund usually invests 60-65% in equity and balance in bonds. As we know that diversification across asset classes is the best way to lower risk and to gain a higher risk-adjusted return. To diversify, one can invest across asset classes in a defined proportion. In addition to this one needs to regularly monitor this proportion and adjust asset classes through a process called re-balancing. Balance Mutual funds work in the same manner. Who should Invest in Balance Mutual funds? Experts say Balanced funds are ideal for first-time equity investors as they invest in a portion of the fund in stock while keeping the risk low. First-time investors who do not want to actively manage their portfolio and have low risk-taking capacity can go for balanced funds. One may look at 3-5 years’ investment horizon while investing in balanced funds. Remember that investing in balanced funds is not without risk as their predominant focus is on equities. But a good balanced fund can make your experience of investing in equities less painful by reducing volatility in returns. Therefore, it is important to select the right fund. New Investors entering into equity market. Investors with a small amount and looking for diversification. Risk adverse investor looking for diversification. People who cannot find time for stock market research. Birla Sun Life Balanced 95 – I am investing in Birla Sun Life Balanced 95 fund since 2014. I have selected direct fund for the investment. It is hybrid equity oriented fund. 75% holding of this mutual fund is in equity and remaining in debt. 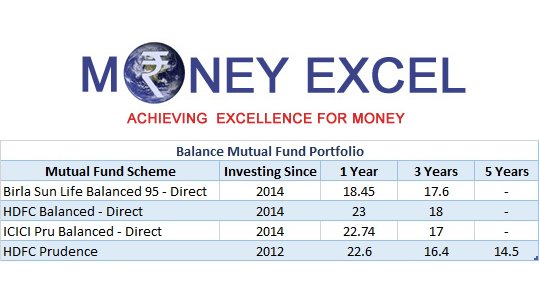 The performance of this mutual fund is very good & it is expected to give better performance in future. HDFC Balanced Fund – HDFC Balanced fund direct plan is my next choice. I am investing via SIP route in this fund since 2014. HDFC balance fund invests 70% of fund in equity and remaining in debt instrument. The historical performance of this fund is very good. ICICI Pru Balanced – I have also invested in ICICI Pru Balanced fund direct plan via SIP route. It is equity based hybrid fund. This fund invests 66% of the fund in equity and remaining in debt. This fund has given me highest return 22% in last one year. 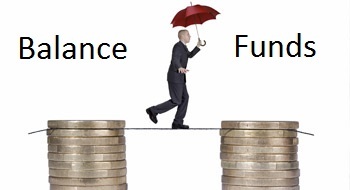 HDFC Prudence Fund – The last balanced fund in my portfolio is HDFC prudence fund. It is also equity hybrid fund. I am investing in this fund since long. This fund is performing well. If you look at my portfolio carefully all funds are aggressive hybrid fund. Another type of balance fund available in market is conservative fund. However, I have not selected any of that as return given by those funds are low. All funds in my portfolio are from growth category and none are from dividend category. The reason of selecting growth fund is I have sufficient regular income and my objective is long term wealth generation. All plans are direct plan except one HDFC Prudence. All funds have given me very good returns. If you are new investor it is recommended to go for a direct plan. Do you invest in Balance Mutual funds? What is your take on my balance mutual fund portfolio? Why four funds from the same category of Balanced Funds. Is this over diversification?? How many funds can one have?? You can have at the most 2 funds (maximum 3 funds) from same category. Dear Raviraj ji,Your Balanced mutual fund portfolio is well balanced.Only one doubt comes in mind about overlapping of these funds. My primary objective at that time was to reduce risk and diversification.As I was new to stock market investment, I have selected multiple funds from same category.As fund was giving good return, I continued my investment.